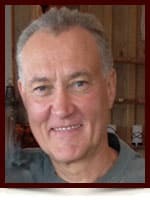 Geerd Grantz - Edmonton's Burial & Cremation Professionals | Trinity Funeral Home Ltd.
Geerd Grantz (born April 9, 1952) passed away peacefully in the early hours of January 21st, 2016 in the arms of his loving wife, Barbara. He will be missed and remembered by his wife Barbara, his daughter Rachel, his father Gerd, his brother Ove (and wife Barbara), his two sons Adrian (and wife Susanna) and Mark (and fiancee Jolene), and extended family in Germany, Western Canada, and the US. Geerd passed away with no regrets and had lived a life that was rich in adventure and love. He pursued his passion for cycling in Europe, America and Canada and did so while influencing and inspiring many people along the way. He was a gifted musician, who continued to share his love of classical music beyond his years in an orchestra. He will be remembered for his strength of character, honesty and integrity, and his passion for an active and purposeful life. Cycle Logic bike store (where Geerd dedicated 13 years of service), its cycling club members, friends, and family will be sponsoring and dedicating a park bench in his name that will be placed in Edmonton’s North Saskatchewan river valley. with huge dismay and sadness we learned only now about the passing of our schoolmate Geerd. It has just been a week ago that former classmates of him met again at a class reunion to which Geerd has been invited, too. Thereby we´ve been watching old films of our class trips between 1966 and 1969. This represented us Geerd very impressively e.g. playing his beloved trombone. We are sorrowful that we cannot meet him once again and we´d like to express our sincere condolences to the whole family of Geerd. We will always honour his memory. I knew Geerd for a brief while in Wuppertal in 1987 when he was between orchestra & moving to Canada. He was a tremendous & kind help to me in a difficult time, helping as babysitter for my then 7 year old. He did so generously & with no demands, genuinely enjoying my daughter’s campanionship. I was sorry to see him depart, but knew that he was very happy anticipating a new life. His kindness will live forever in my heart. We will always remember Geerd as compassionate, fit to the extreme, and totally dedicated to you. He was always completely honest when he conversed with us and I could always count on his word as the truth. I found him to be a kindred spirit with his love of music and biking and valued his opinions on bikes. I know Mark & Jolene are holding you close as will your many friends. We are sending our love and prayers and hope that you will continue to draw on the incredible strength that we know you have and we have always admired. We last saw Geerd a few years ago when we had a delightful dinner with him, Joan Greabeiel, & Tim Lawler at Tim & Joan’s place–you were out of town at a bookseller’s convention, I believe. I had forgotten Geerd, whom I had only met once before in your company at a party several years previously, but what struck both Marty and me about him was his utter openness. Here was a man who could fake nothing, but who clearly would never dream of such a thing, for simple lack of need. That he impressed us this strongly over the course of such a brief encounter gives us some small inkling of your loss, and we are so very sorry that you and your family have had to part with him. We’re grateful for our old ties to Edmonton’s musical community that allowed us to get to know him just a little. Dear Barbara and family, I am so sorry to hear of Geerd’s passing. I send you my heartfelt sympathy. You are and will be in my thoughts during this difficult time. I am passing on my condolences I only know your wife and mom Barbra it’s so sad he has passed on, many prayers to all who know him. So may the loving memories ease your loss and bring you peace comfort and strength in the days ahead. you in Germany. You are very special, Barb.